I am sooooo excited about this new product! 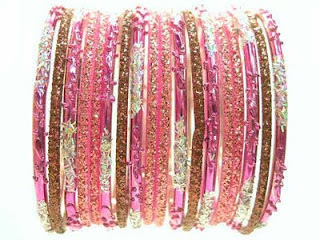 You all know what a huge fan I am of Bajidoo Bangles, right? 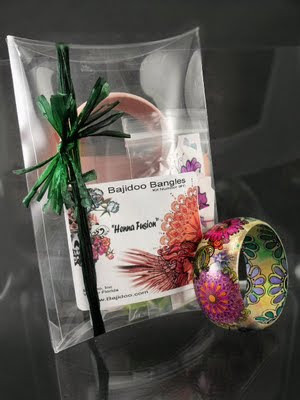 Well Brenda, of Bajidoo Art, has created these kits so you can make your own Bajidoo bangle using HER Bajidoo art! Seriously! 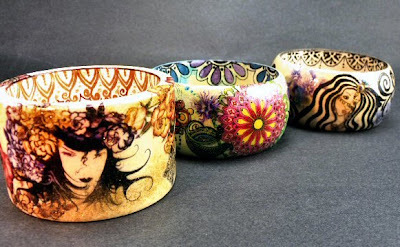 You don't have to have the slightest artistic ability to create a gorgeous Bajidoo bangle, and best of all, it's easy! I was lucky enough to get one of the very first test kits and look what I made! In less than an hour! I can't wait to do another one. It'll be even better! What a fantastic gift these will make! A true piece of wearable art that anyone would be delighted to wear, yet you also get to make it yourself, and at a great price! There are 5 kits to choose from, each with different art, "Henna Fusion," "Regal Feline," "Roses and Ravens (Urban Goth)," "The Debutante", and "The Princess of the Dune (Tribal henna Fusion)". Get multiple kits and mix and match the artwork! Kits will be available at the store starting Wednesday for only $19.99! Want to see it in action? We are delighted to host Brenda of Bajidoo Art for a bangle making demo here at the store! Cost: Just purchase whichever kit you want! The workshop itself is FREE! The workshop is free, but there is limited seating. If you'd like to reserve a table spot, please email me, ASAP. New Glass Bangles on the website! The store has been keeping me busy, and I apologize for taking so long to get some new glass bangle sets up for purchase. That mistake has been corrected! I have 20 new bangle sets up for size 2.6 Small and size 2.10 M/L. I have fewer for size 2.12 XL, but I have more working! 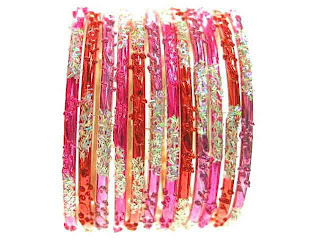 There are some exciting new sets up using the fancy wedding style bangles in bold fun colors. I love this Indian bangle set with a trendy combination of pink, silver, and brown. 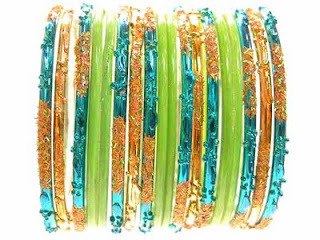 Turquoise blue and lime glass bangles have been a huge hit lately. I've added some golds in this set to give it a fun fall look. Tickets For "A Tribal Garden"
Now available at the store and online! We are proud to sponsor Florida Tribal Dance's annual dance gala again! Every gala is better than the last, and after hearing a preview of what's to come...I can't WAIT! Tickets are ONLY $15 in advance ($20 at the door). This is a bargain price for the show will see! Tickets can be purchased at our store in College Park, Beachcombers Bazaar or at Divine Mother Earth in Sanford. You can purchase them online at www.BeachcombersBazaar.com. Join us for a show you'll never forget! Our Simply Henna Workshop: Henna Tattoos for Beginners is sold out for the October 28, 2009 class. For those of you signed up for the workshop, I can't wait! It's always a blast! You will get plenty of henna to play with during and after the class, and you will be rip-roaring-ready-to-henna-everything-within-reach by the end of class! The next basic class will not be until 2010. Expect fun floats, the EHS band (The Pride of College Park), candy, and more! This was a fun community event last year, and we are looking forward to it again. Stop by and grab a curb in front of Beachcombers Bazaar to watch the parade! The parade begins at 6:30 so come around 6:00. We'll stay open until the festivities have died down. We will also be hosting our monthly Guild of Orlando Henna Artists meeting that night, so be on the lookout for Orlando's local henna talent! 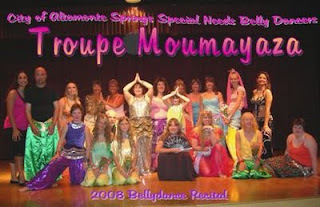 We love supporting our special needs belly dancing friends in Altamonte Springs. Please show your support for this fabulous group by going to the show. It's only $2.00 and it's a fantastic show. Cost: ONLY $2.00 at the door - spread the word! Click here to print a flier about the show. That's right, our new Studio 3 Henna Design Book is out with all new henna designs! This book contains 20 full size hand designs and more than double that of individual henna design elements. Ideas for modifying designs will help increase your henna vocabulary and speed your freehand henna technique. Of course complete instructions are included along with sealer info, tips, tricks, and more! 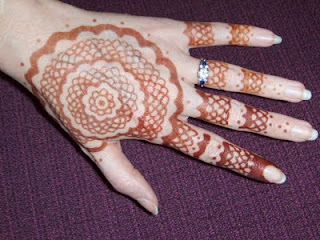 Purchase Henna Design Studio 3 here. I try to make every book better than the last, and this one is a gem with henna symbolism and exciting new design styles. Jazz Fest On the Drive 2009! College Park's free yearly Jazz Festival is going to be better than EVER! Beachcombers will be open with specials and henna for your pleasure. We will be right behind the stage this year, so we have great seats for listening to the music without being packed into the crowd!